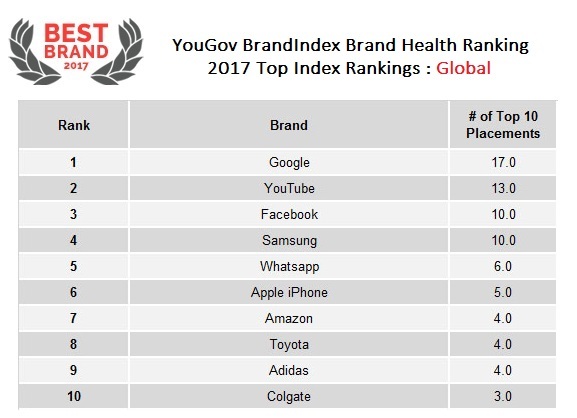 Google has topped YouGov’s inaugural global brand health rankings. In a list dominated by online brands, the search giant comes in just above sister company YouTube as well as number three, Facebook. Other tech firms feature prominently on the list. Device manufacturer Samsung coming in fourth, messaging service WhatsApp in fifth and Apple’s iPhone in sixth spot, while online retail behemoth Amazon is seventh. The top ten is completed by brands with longer histories – Toyota, adidas and Colgate. The rankings are based on YouGov BrandIndex data from across the world. BrandIndex operates in 32 countries across the globe, covering markets in North America, South America, Europe, Africa, Asia and Australia. 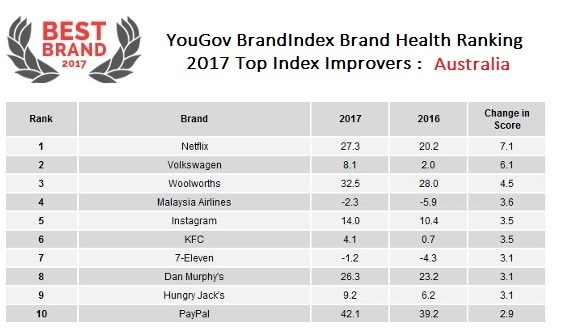 YouGov used the Index score for the list which assesses overall brand health. It takes into account perceptions of a brand’s quality, value, impression, satisfaction, reputation and whether consumers would recommend the brand to others. 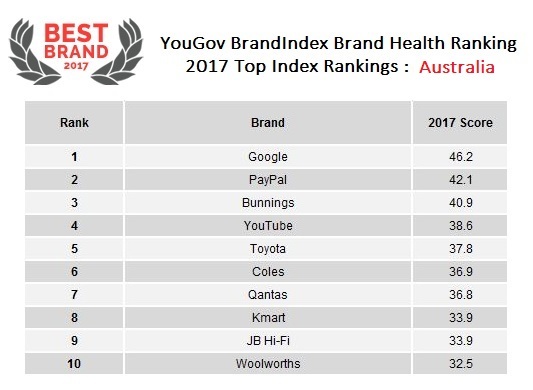 In parallel to the top 10 global list, YouGov is also released Australia brand health rankings. The list is dominated by established retail organizations – Bunnings, Coles, Kmart, JB Hi-Fi and Woolworths. Google and PayPal take the top 2 spots with another Google company, YouTube, a strong fourth.